Boise, ID - Portland International Raceway captured the NHRA Summit Racing Series Northwest Division Final Team Championship along with four racers that punched their tickets to the Summit National Championship in winning Saturday’s Race of Champions. Boise, ID - In Summit Racing Series categories, it was Juliet Barnhart leading the way in Super Pro taking the win over Chris Jaggers. Levi Burlile out drove Carl Youngstrom in Pro and Rex Petersen out dueled Zak Pedraza in Heavy. Boise, ID - In one of the closest finals of the day, experienced Super Comp racers, Michael Dalrymple, Sunnyside, Wash., drove his ’09 Mullis to the win over Mike Shannon, Kelowna, B.C., in Super Comp. Boise, ID - Ken Nelson and Terry Anderson scored for the home state at the Napa Auto Parts Ignitor NHRA Lucas Oil Drag Racing Series at Firebird Raceway in Boise, Idaho. Boise, ID - Local racer Mike Coltrin of Boise, Idaho, scored the Super Gas title at the NHRA Lucas Oil Drag Racing Series, Napa Auto Parts Ignitor presented by Peterson Chevrolet at Firebird Raceway. 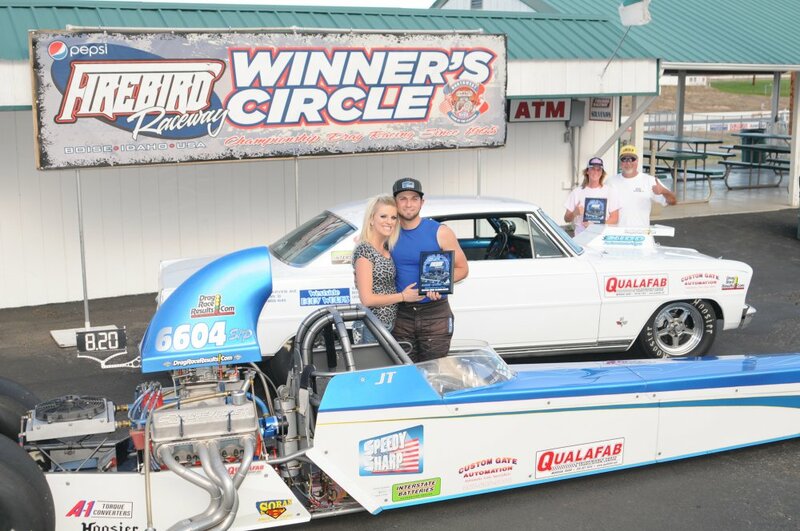 Boise, ID - Sunday September 15th marked the final Gold Cup Series points race for 2013 at Firebird Raceway in Boise, Idaho. The Thomas Family is no stranger to the long racing season's out West, and showed so by finishing strong with final round victory's by Jason and Lisa in both Super Pro and Pro respectfully. Boise, ID - Lafferty and Griffiths win for the home state. Lafferty, Wendell, Idaho, qualified No. 7 and took out Sadie Floyd, Happy Valley, Ore., in the final of Top Dragster with a lap of 7.053 seconds at 182.40 mph for the win. Griffiths, out of Fruitland, Idaho, got the starting line advantage in Super Gas which propelled him to his first ever Super Gas win. Boise, ID - Boise’s own Gordon Boven drove his ’72 Barracuda to the Super Street title going 11.125 seconds at 134.48 mph to outrun Steve Glenn, Covington, Wash., in his ’55 Wagon.